Applicable for Reinstatement of NRPP Measurement Certification that has lapsed more than one year, but less than two years from reapplication date. 16 CE credits. 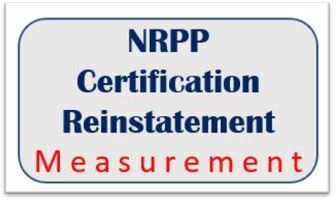 This 16 hour CE course is a review of the entry level measurement course and approved for the purpose of reinstating NRPP Measurement Certification that has lapsed more than one year, but less than two years from reapplication date. If certification is lapsed over two years from reapplication date.